The Xiaomi Mi 8 series was announced back in May 31 featuring three variants, the Mi 8 Explorer, the Mi 8 SE and the vanilla Mi 8. Now its seems the series will be getting a new variants dubbed the Xiaomi Mi 8X. 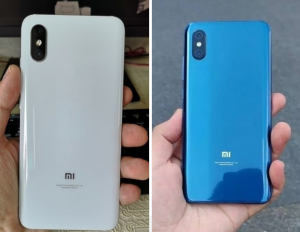 Image of the new device was recently leaked online and the smartphone will be a mixture of all three Xiaomi Mi 8 series variants. The upcoming Xiaomi Mi 8X will feature Snapdragon 710 and will have an under-display fingerprint scanner. The body of the smartphone will have the same form factor as that of regular Mi 8. From the image shared, the device features a screen with rounded corners. The back panel will have curved edges and the leakster also revealed that it will feature an under- display fingerprint scanner. The tipsters also shared a photo photo of Lei Jun boarding a plane with a white unknown phone in its hand. Although it was not confirmed if the smartphone was the Xiaomi Mi 8X. It looks like Xiaomi Mi Mix 2S or the Mi 8 with a photoshopped fingerprint scanner out of the way.